Proudly Australian made. The Auto and Industrial Equipment range of Rotary Parts Washers are designed to clean grease and oil from aluminium, brass, cast iron and plastics. The Rotary Parts Washers are insulated and constructed from Stainless Steel with Stainless Steel Pumps making them long lasting and ecomonical to run. Saving time, money and labour! 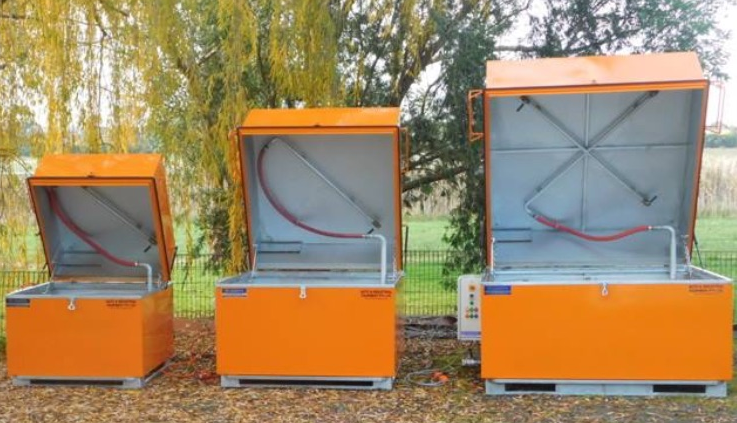 The Rotary Parts Degreaser combines a rotating basket with high pressure surrounding jets of heated water and detergent to create an enclosed enviroment which speeds up the cleaning process of parts without wasting production time. The parts flash dry and do not rust because there is a light rust inhibitor in the recommended detergent. by reduces water and detergent usage. And it is insulated which reduces power consumption and makes the unit cost effective to run. The water is quickly heated to operating temperature by three immersed heating elements using three phase power. The heating elements are thermostatically controlled by a three phase power box with 24 volt controls for the safety of the operators. The wash cycle is controlled by a timer which can be set to length of time required to wash different degrees of dirt build up and the water temperature is automatically maintained by the thermostat. The Auto and Industrial Equipment Rotary Parts Degreaser has the added benefit of Stainless Steel construction.